I love to decorate for the holidays but it can be expensive! 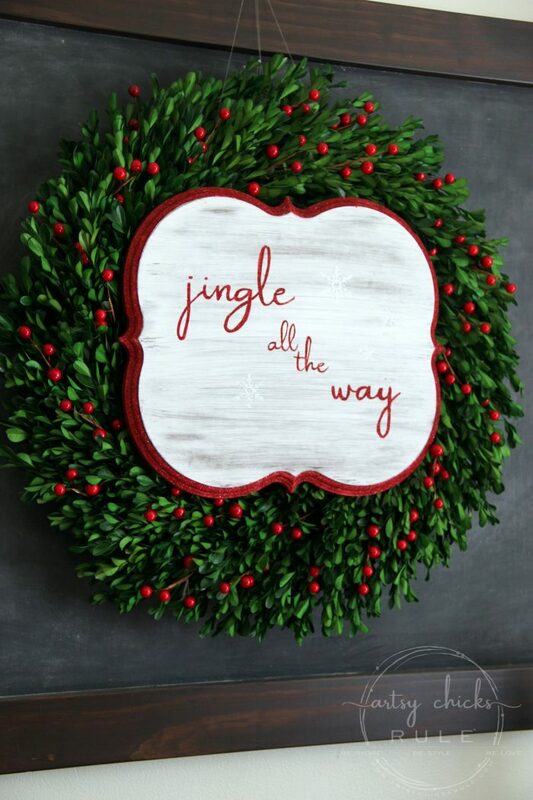 Not so with thrifty finds like this Jingle All The Way sign I made out of an old wood, wall plaque. 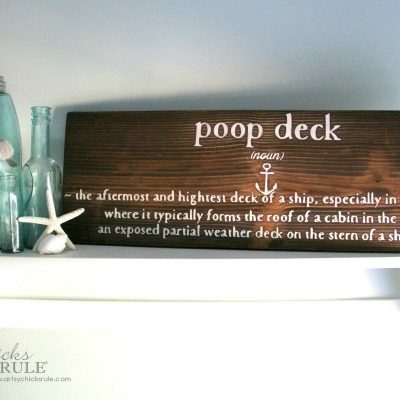 I always on the lookout for things I can make signs out of at the thrift store. It’s always fun when I come across something with a pretty shape, like this…. Didn’t have a clue what kind of sign it’d be when I picked it up though. But I thought I’d share it as my Trash to Treasure this month. 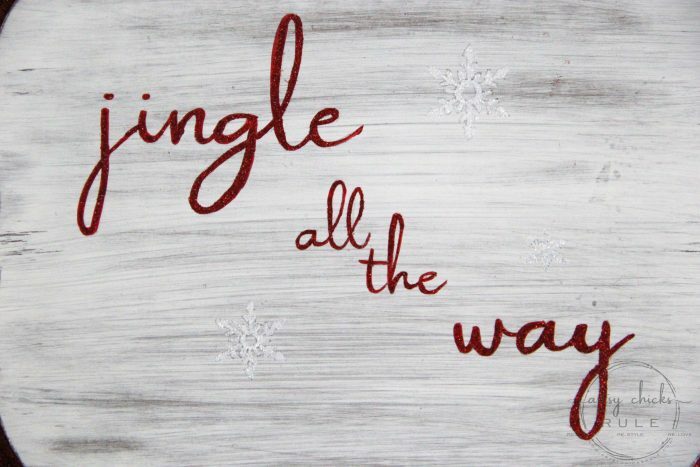 And since we are heading into the holiday season, I thought I’d share a holiday sign. 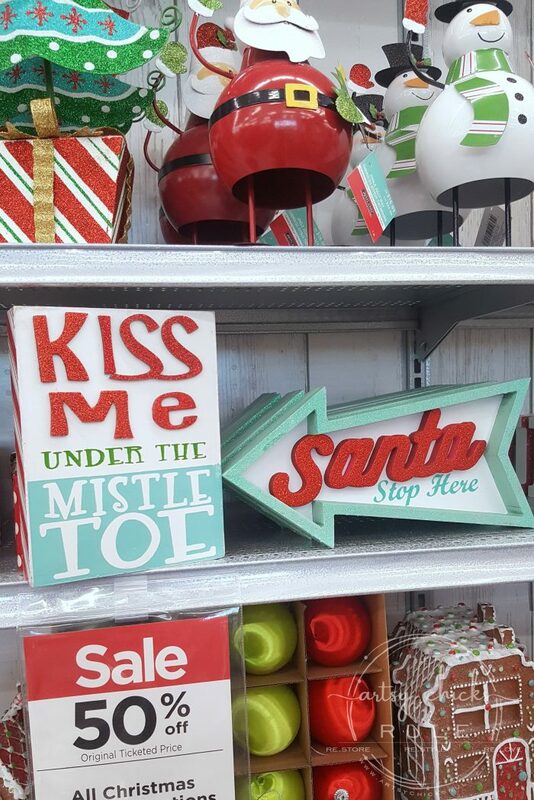 I happened to go over to Michael’s recently and saw all the cute retro stuff they have this year. If you follow along on Instagram with me you might have seen these photos in my Instagram stories when I was at Michael’s the other day. I have been trying to be better at sharing over there! It’s tough to stay plugged in all the time but I do love to share things I find with y’all (or even just random personal things too). If you don’t follow along yet, I’d love it if you did! You can follow me here >>> Instagram. I share things more often in the “stories” than I do in photos and they disappear after 24 hours. So my sign was sort of inspired by all of this. 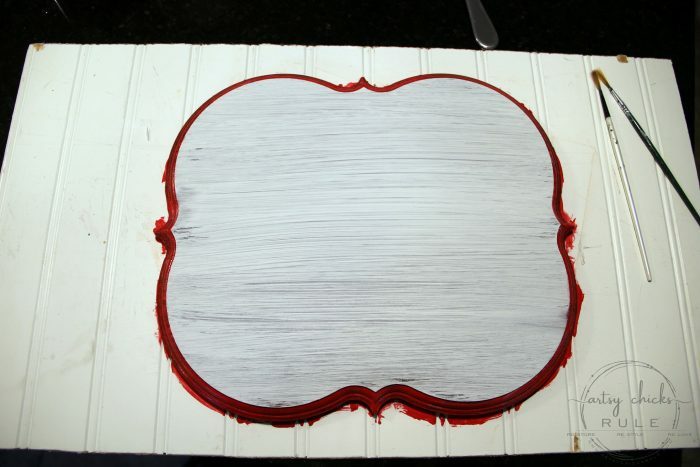 I knew I wanted it to be classic….red and white. So I painted the center white and the edge red. 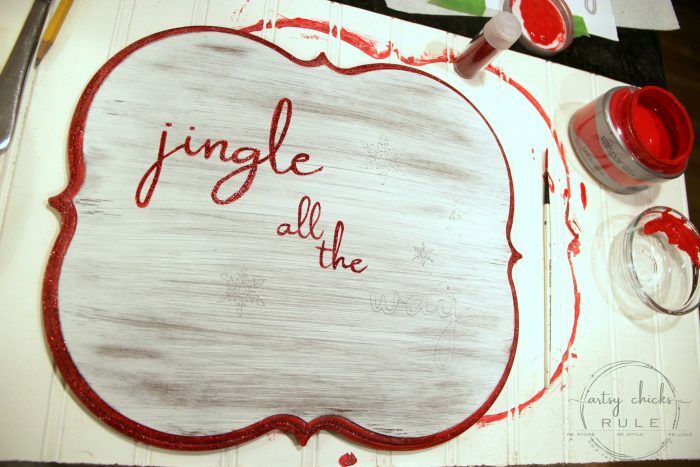 I also wanted to give it that retro feel so while the paint was still wet, I sprinkled on red glitter. 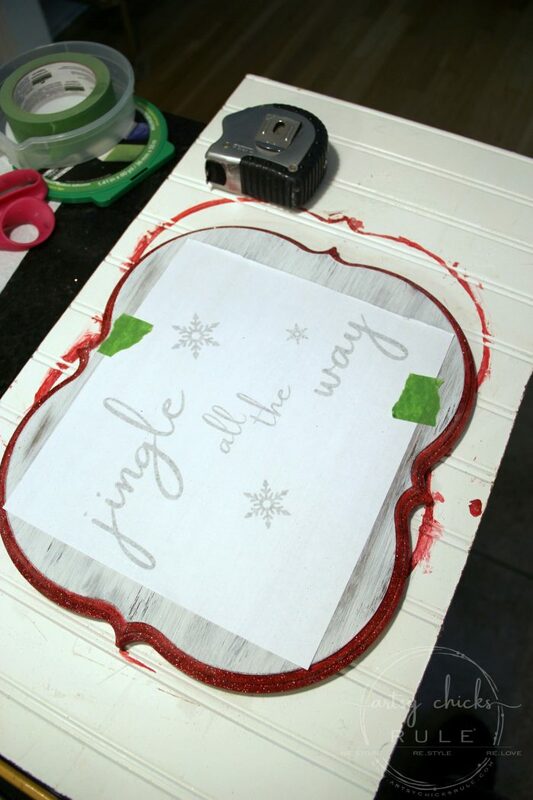 That didn’t work so well because the paint dried quickly so instead, I went back over the dry paint with Mod Podge and sprinkled again. I only used one coat of white paint. Then once that was dry, I went over it with sand paper to distress it a bit. I printed out my graphic and tried to transfer the lettering the way I did in this post. 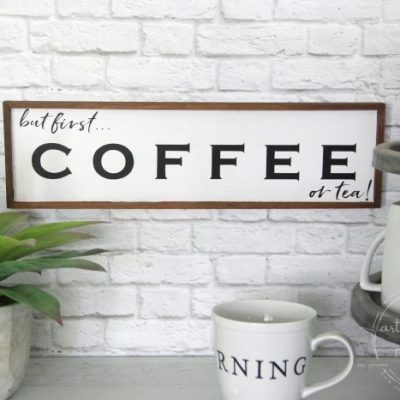 But none of the ink would transfer…eek! I have never had that happen BUT I did buy a cheapie refill off of Amazon so maybe that’s why? So I pulled out my trusty transfer paper. This stuff works great but I was really hoping to not have to spend the time tracing all the letters. Oh well, getting it done one way or another. Once I had it all traced, all I needed to do was paint it “in the lines”. I use my handy script liner brush for this. I stopped after every letter to add the glitter while the paint was wet. 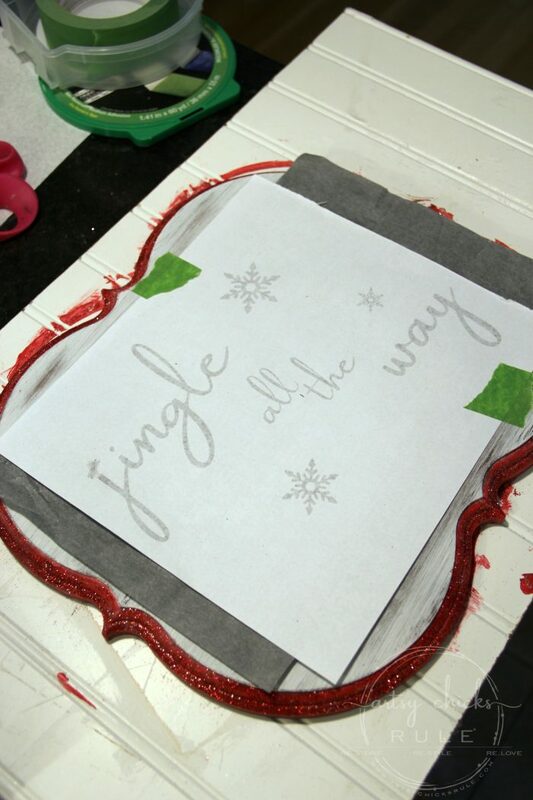 I didn’t want to have to go back over those small letters with Mod Podge so made sure to sprinkle when the paint was wet. They do show up in person a bit better than they do in the photos though. There are Christmas storage boxes everywhere with stuff half out all over, oh my! I didn’t have a thing decorated, or even out, when I needed to take photos of this brand new Christmas sign. The boxwood wreath did get the usual red berries. 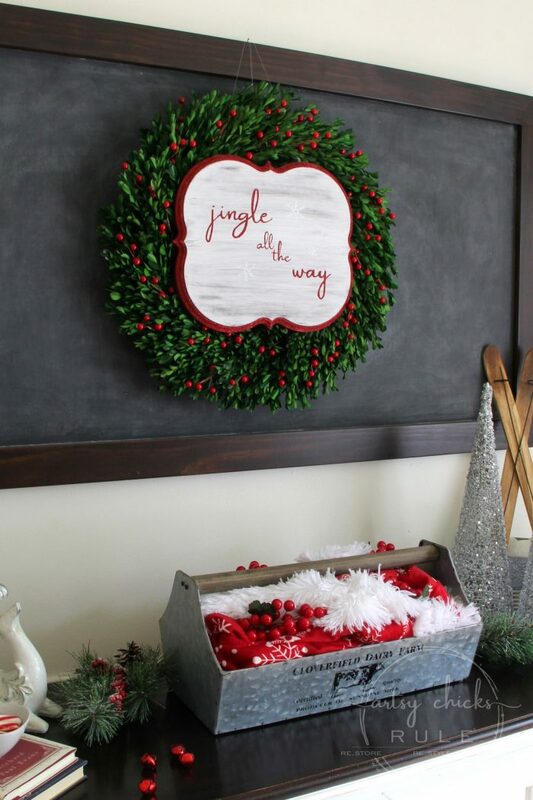 I love to just stick them in and around instead of changing out the entire wreath. 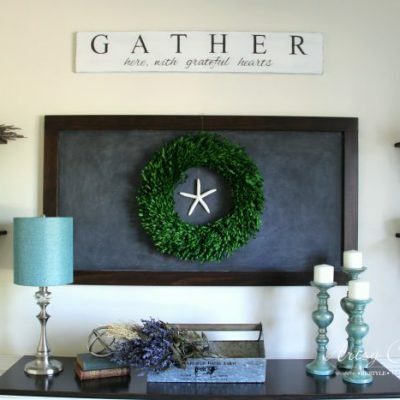 I have done this the last few years for all of my wreaths and love it! 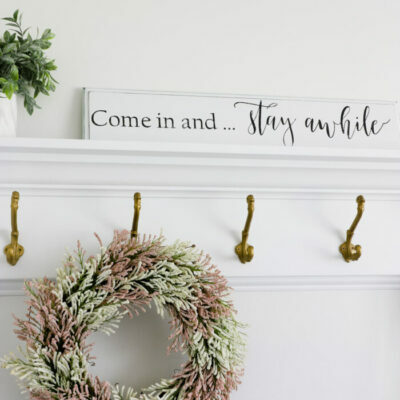 You can see it here in my Christmas Home Tour from last year. 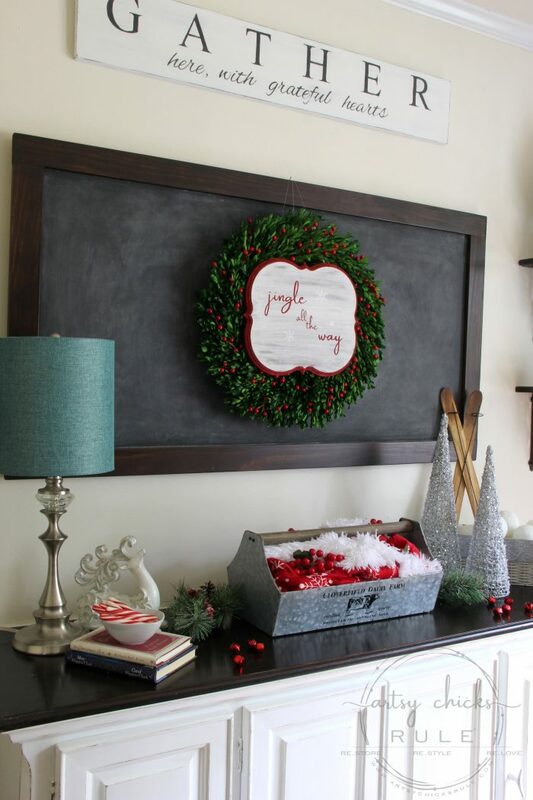 I hung the wreath up by adding two screws to the back…. …and looping fishing line around them. 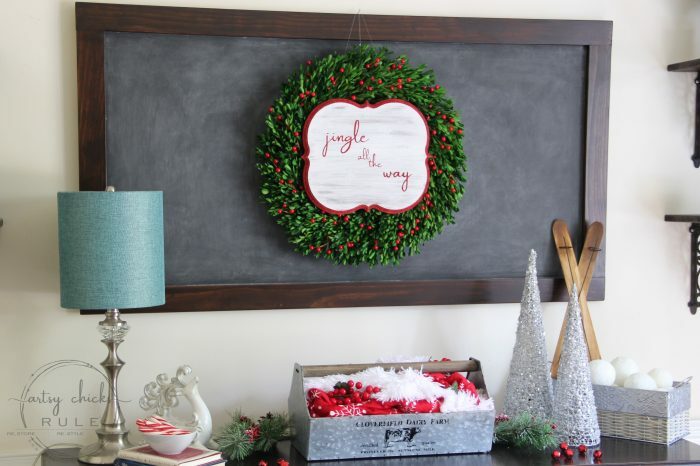 It then got looped and knotted and hung by the same nail on the chalkboard frame that the wreath hangs from. You don’t really notice it in person but you can see it in the photo below. 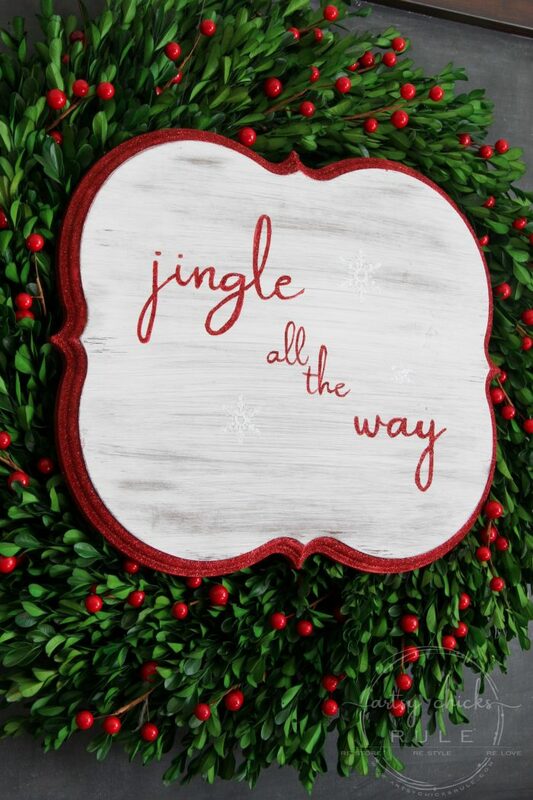 Many of my holiday decor items have been thrifty finds that I’ve given a makeover to, or made a sign out of. 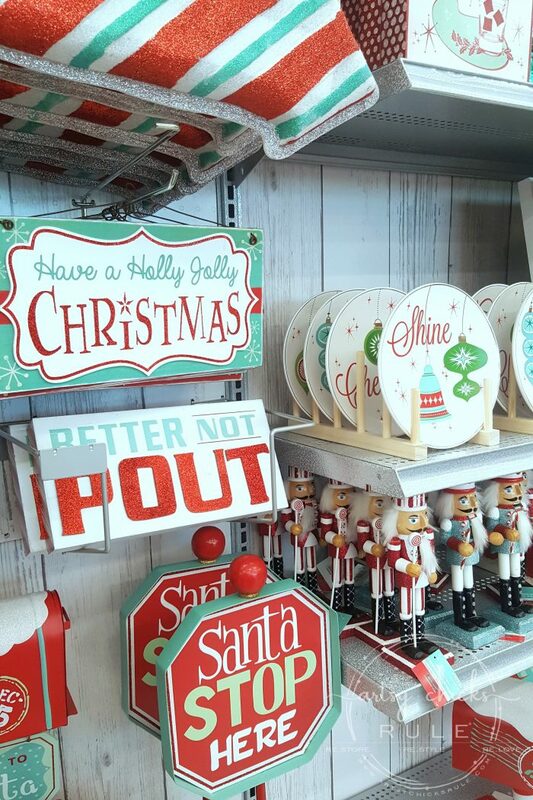 Like this red and white retro, “It’s the Most Wonderful Time of the Year” sign or this retro “Santa” sign. If you don’t want to paint this, you can just print out that retro printable I provided above and pop it in a frame! 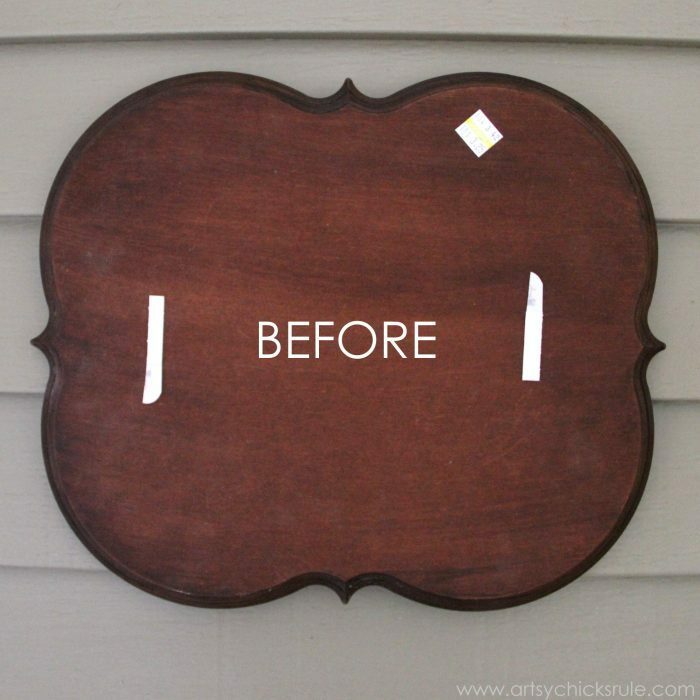 Take it to a print shop or Office Max and have them print it out in red (or however you like), grab an old frame from the thrift store and paint it red. 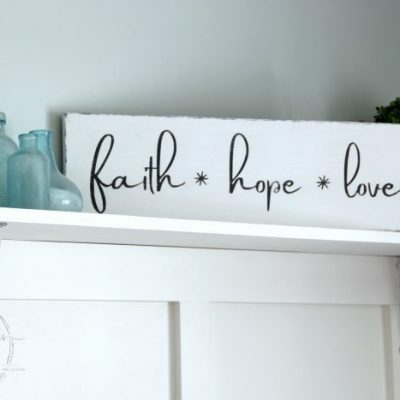 Hop on over and see what kind of treasures my friends made out of these…. 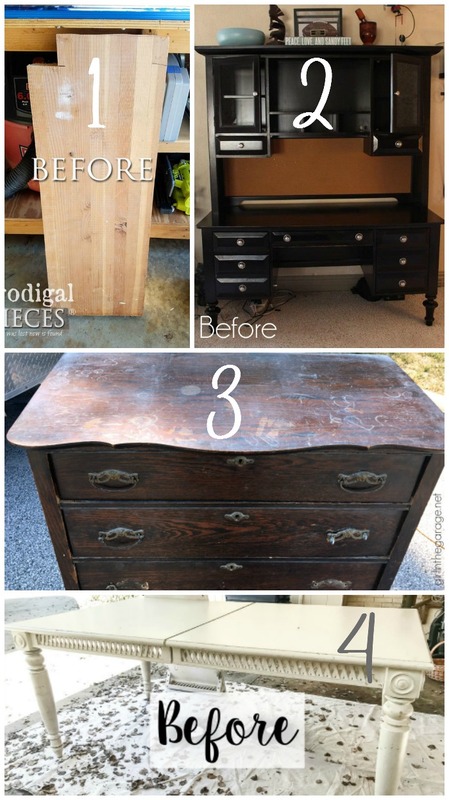 Want to see even more Trash To Treasure Transformations? 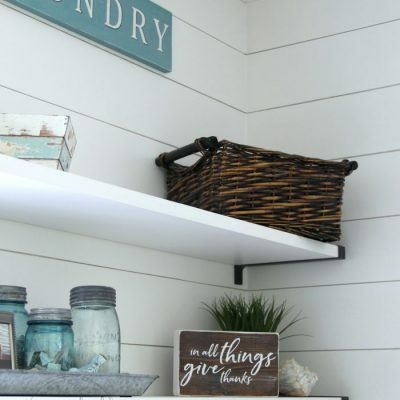 Click here to see the full gallery. 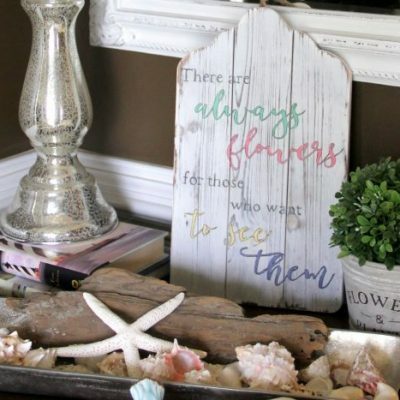 Beautiful; but was wondering how you attached the board to your wreath?. 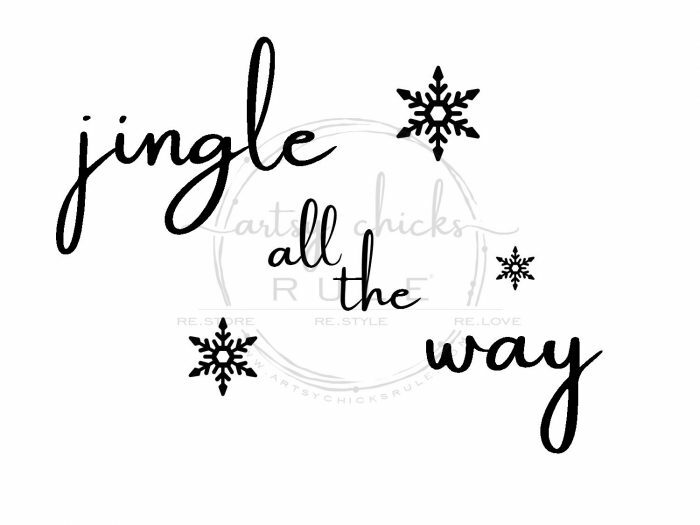 Thank you for the ‘jingle all the way’ printable download. 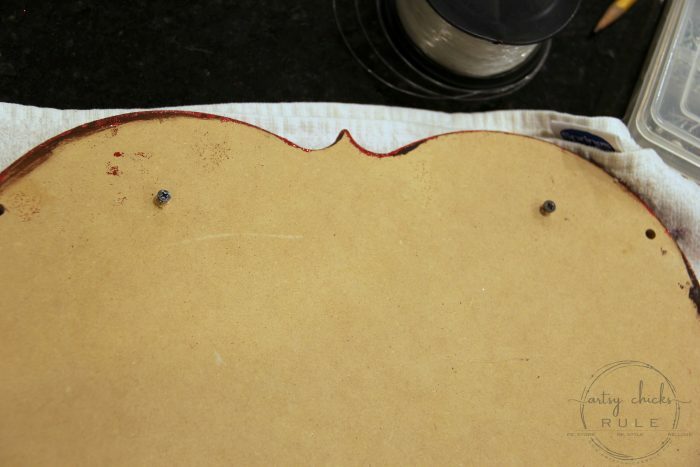 After going back to look at your pictures as well as the back of your board; I now see the fishing line. 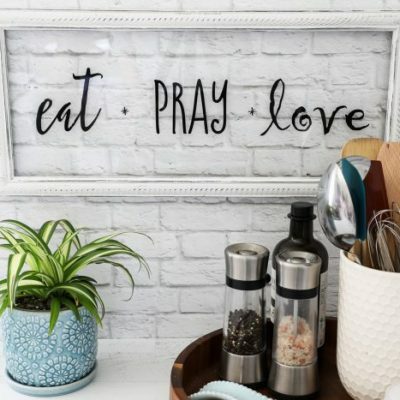 What a clever way of hanging. Enjoy your day and Thanks again. How absolutely fun, Nancy! I too love to scout out the wood section of the thrift store. So much potential! I love your signs and all the other stuff you do! Up above though it says to click on the link to see your It’s A Wonderful Life (my favourite Christmas movie) sign but it’s actually It’s The Most Wonderful Time of the Year.. Was that a misprint or is there another sign?